UVic President Jamie Cassels and Board of Governors Chair Beverly Van Ruyven stand in front of a blockade of students at the entrance to the Senate Chambers. Photo by Mike Graeme, Senior Staff Writer. 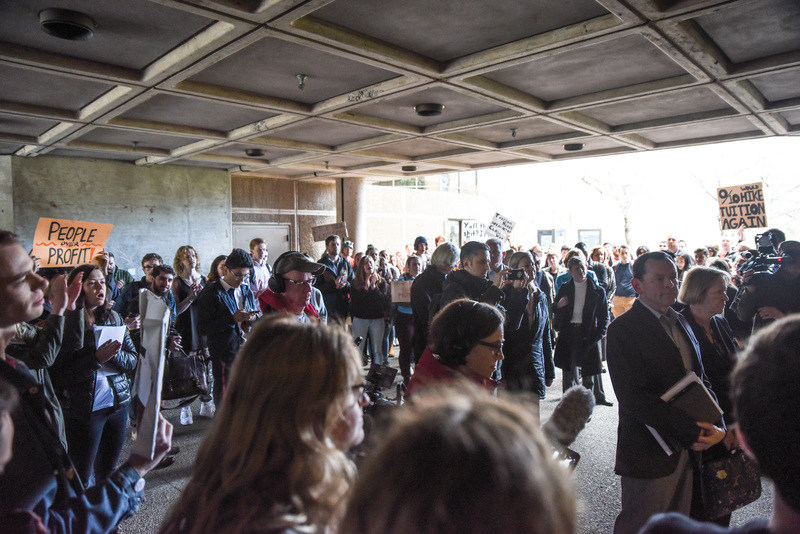 On Tuesday, March 26, a mass of students — estimated between 100 and 200 people — rallied outside the University Centre Building at the University of Victoria to protest the Board of Governors’ (BoG) proposed 2019-2020 budget. The budget included a 15 per cent tuition raise for incoming international undergraduate students — the third notable increase of fees for international students in three years. Students were also protesting the university’s continued investments in fossil fuel companies, which amount to $39.72 million as of 2017. Over a period of 24 hours, a series of events ensued, beginning with a rally and blockade of the Senate Chambers — the meeting room for the BoG — and ending at 11 a.m. on Wednesday morning with a list of demands submitted to university administration and the provincial government following an overnight camp-out on the floor of the Chambers. “Jamie Castles is basically a vampire,” reads one sign. Photo by Mike Graeme, Senior Staff Writer. 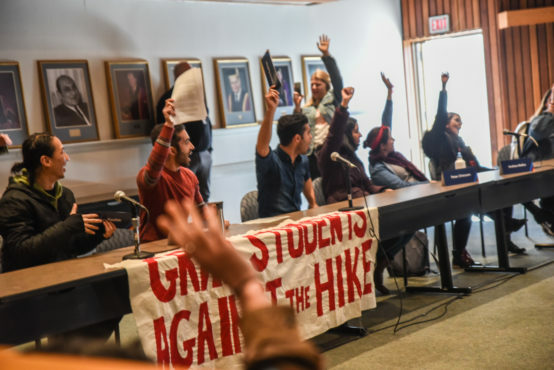 “This is the third time the university is deciding to approve the proposal of increasing the international students tuition,” said Arash Isapour, chair of the Graduate Students Society. Last year, the university approved a 20 per cent tuition raise for incoming international undergraduate students, a year after they decoupled domestic and international tuition fee raises. This means that while domestic tuition fees are capped by law, international student tuition fee raises are not. “The [increase] rates of [both] international and domestic [tuition] before 2017 … was just two per cent. And then they decoupled that, so the increase for [international] graduate students [became] four per cent and for undergrads the next year it became 20 per cent,” said Isapour. Students rallying in front of the University Centre prior to the Board of Governors’ arrival. Photo by Mike Graeme, Senior Staff Writer. 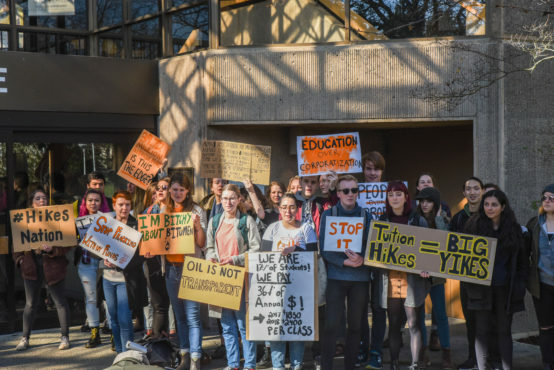 Tuesday’s protest started as two separate student movements: one for tapering international tuition hikes and one for freezing fossil fuel investments. But they have since converged, and the coordinated effort is having a dual impact, said Elora Adamson, member of Divest UVic. “Students [from both sides] feel as though the university is not accountable to them and it’s acting as a business … So I think that joint messaging across the board should hit pretty hard,” she said. PhD student Phil Henderson, who helped organize the protest, agreed that despite different agendas, the two movements are closely tied. “I think it’s important to draw the international connection from divestment too. The effects of global climate change are being felt everywhere around the world, not just here,” said Henderson. As the Board of Governors walked towards the Senate Chambers, students formed a corridor around them, cheering and chanting until they encircled them. Photo by Mike Graeme, Senior Staff Writer. As the BoG walked up the steps of the University Centre, students created a corridor for them to walk through. But as the Board members approached the doors to the Senate Chambers, protesters blocked the entrance and Board members found themselves encircled by the crowd. International students then took the mic of a portable P.A. system and began making remarks face-to-face with UVic President Jamie Cassels and the rest of the Board. 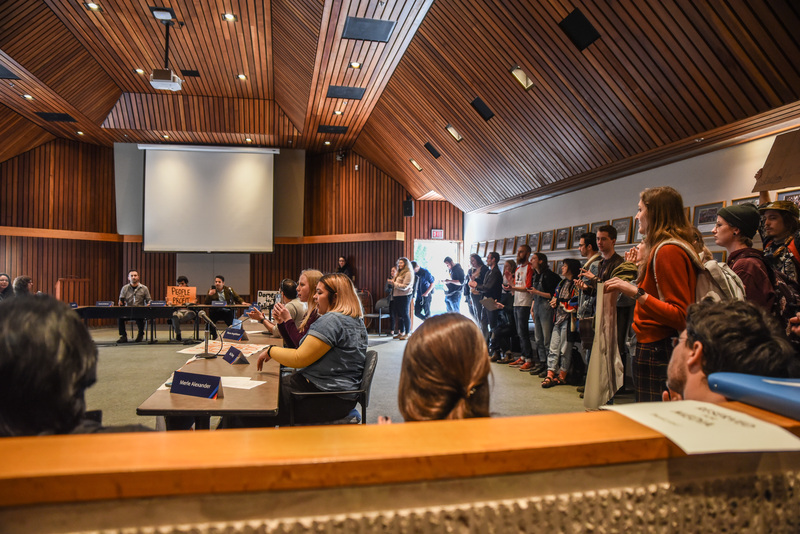 “I was just elected as Director of International Student Relations in the UVSS, so I’m sure we’ll be in touch a lot,” said Efe Türker, standing before Cassels. “My friends can’t afford food anymore. They have to use the food bank now. My friends can’t afford staying in Canada anymore … They were committed to staying here, but you voted in that room to send them back for profits that are invested in fossil fuels, not back to us, not back to society as a whole,” Türker said. According to Alexandra Ages, the coordinator of the UVSS Food Bank and Free Store located in the Student Union Building, 40 per cent of the Food Bank’s users are international students — while making up just 18 per cent of the total student population at UVic. 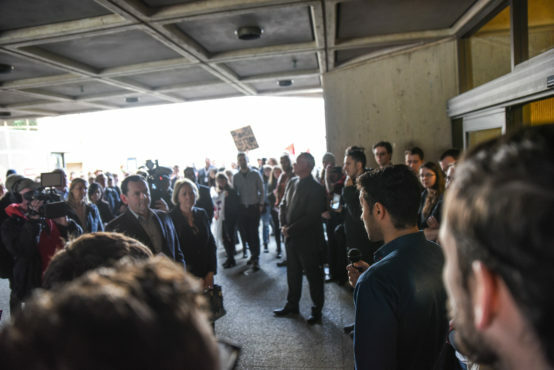 “The vote you are about to hold inside for another increase [will] only create further divisions within our global community … You’re creating class differences, divisions, and you’re sparking … racism on campus,” Türker said. Emma Kopeinigg, another international student, took the mic next. “This is a country that prides itself on being liberal and being equal and fair and multicultural and supportive of each other, yet right now, in the university that claims to follow all of these traits, I feel cancelled out,” she said. Kopeinigg wasn’t only representing herself, but also her sister who will be attending UVic next fall and will face tuition fees that are 40 per cent higher than what Kopeinigg paid two years ago. Before the Board was let inside the chambers, student spoke in a microphone, explaining why and what they were protesting. Photo by Mike Graeme, Senior Staff Writer. “I’m not even 20 and I’m already indebted, and I can never pay all of that money back,” said Kopeinigg. After international students had made their comments to the trapped Board members, Gillian Wiley from Divest UVic brought up the issue of divestment. “The university’s mission statement [includes] being deeply committed to a better future for people, places, and the planet. The UVic endowment fund of $39.72 million invested in fossil fuel companies that pump carbon into our atmosphere stand in direct opposition to this commitment,” she said. 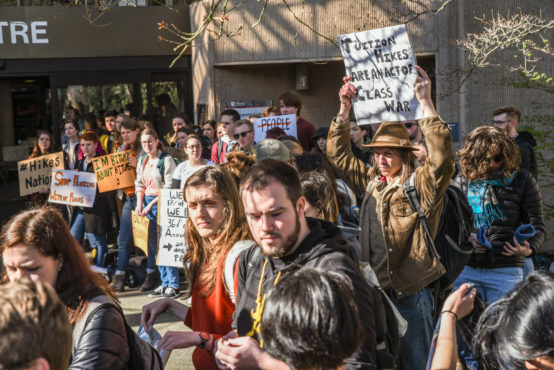 A year after its founding in 2013, the Divest UVic faculty group held a referendum, where 66 per cent voted in favour of divestment. The following year, Divest UVic students held a similar referendum with 77 per cent voting in favour. Gillian Wiley of Divest UVic speaks directly to UVic President Jamie Cassels. Photo by Mike Graeme, Senior Staff Writer. Wiley pointed to other universities that have already frozen their investments in fossil fuels — namely, Laval University, the only university in Canada to have fully divested. “Follow in the footsteps of Laval University and the 72 other universities across Canada, the U.K., and the United States that have committed to full divestment from fossil fuels,” she said. A photo of the Board trying deliberate surrounded by students in the public galleries and on the floor. Provided photo via Michael Lo. Board members were eventually able to enter the Senate Chambers, followed by protesters who filled the public galleries. The meeting started, but was quickly interrupted as the two doors at the back of the room — that normally stay closed for meetings — opened and protesters shouting “stop the hikes!” marched in and flooded the floor of the Senate Chambers. Once again, the Board found themselves surrounded by protesters. “How much money do you make a year, Jamie Cassels?” asked another member of the audience, as the Board chair, Beverly Van Ruyven, attempted to maintain order. The meeting continued, over ongoing shouts and chants from the audience. Eventually, it was Vice-President of Finance and Operations Gayle Gorrill’s turn to present on UVic’s Budget Framework and Three-Year plan. Gorrill noted that the university is required by law to maintain a balanced budget — they are not permitted to have a deficit. She then spoke specifically to the international student tuition raise. “UVic values its international students,” said Gorrill. This statement was met with a raucous response from the crowd, as Gorrill attempted to continue speaking over the shouting. Students gather to protest. Photo by Mike Graeme, Senior Staff Writer. “Have you ever had to choose between rent and food?” asked one audience member. This time, the chanting didn’t end. The Board of Governors couldn’t vote or speak over the chanting, eventually exiting out the back doors to the sounds of the crowd’s boos. Gorrill continued to power through her presentation, noting that the formation of a university budget was a complex task. 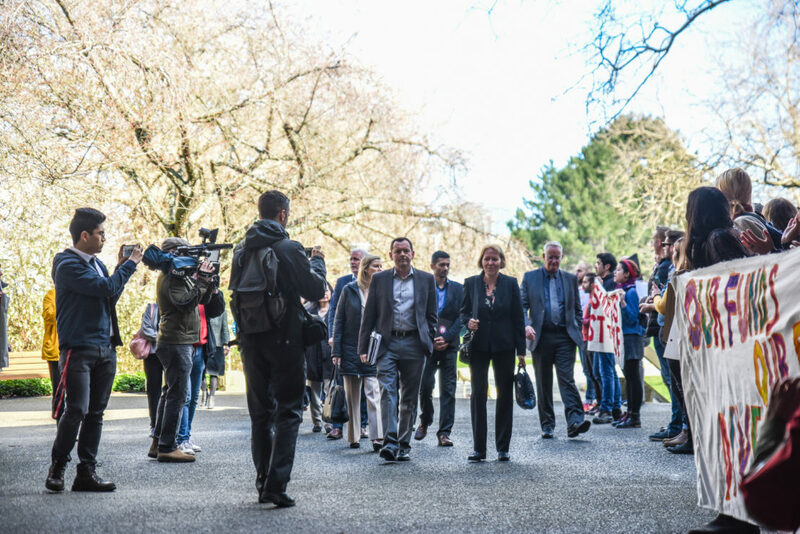 While UVic receives 50 per cent of its funding from the provincial government, they do not currently receive any government funding for international students. Following Gorrill’s presentation, David Zussman, Chair of the Board of Governors’ Finance Committee, moved to approve the budget for the 2019-2020 academic year. This time, the chanting didn’t end. The Board of Governors couldn’t vote or speak over the chanting, eventually exiting out the back doors to the sounds of the crowd’s boos. The boos then turned to cheers as the students in the public galleries flooded onto the floor and sat in the seats previously held by Board members. The Senate Chambers, after it was fully taken over by students. Photo by Mike Graeme, Senior Staff Writer. After some speeches and continued chanting, the remaining students in the room decided to conduct a sit-in of the Senate Chambers overnight. 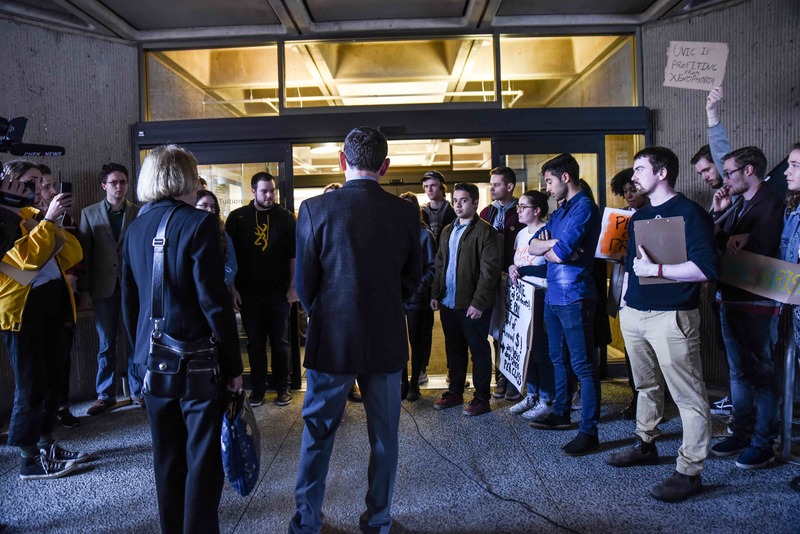 As the afternoon turned to evening, evening into night, and night into morning, the protesters formulated a statement outlining a number of demands — addressed to both the UVic administration and ministers of the provincial government. “We are the students who you preferred not to meet, from whom you averted your eyes, and who you left behind in the Senate Chambers when your decisions could not be made in the light of day and in the face of our anger,” reads the statement. “If we are truly in a period of such austerity that international students must repeatedly be made your financial scapegoats, an investment of $39.72 million in fossil fuels is fiscally imprudent. “Our anger is rooted in a series of decisions made by the Board of Governors,” it continues. After the Senate was taken over by students, they made a symbolic vote to rescind the motion to increase international student tuition fees. Here, the students vote in favour of the motion. Photo by Mike Graeme, Senior Staff Writer. The protesters also outlined their objections to UVic’s investments in fossil fuels. 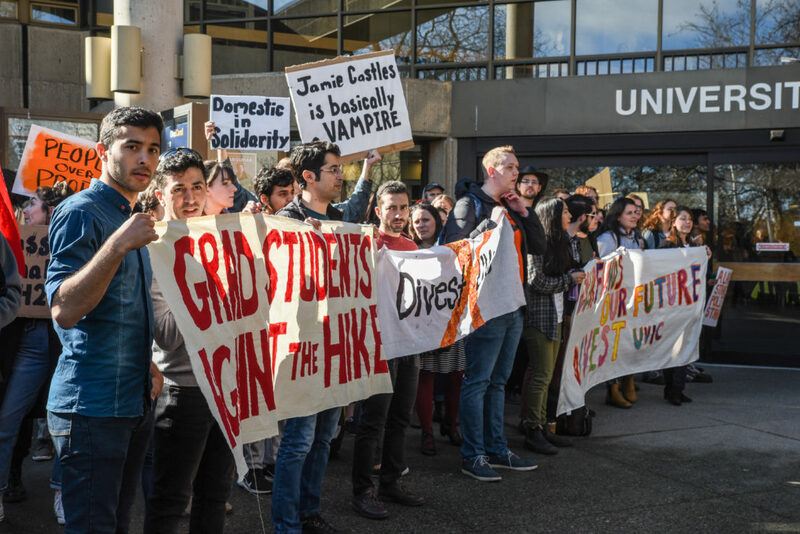 The document then outlines a series of demands, including for the university to recouple domestic and international student tuition fees, conduct a third-party audit of the university’s usage of international fees, increase student representation on the Board of Governors, and divest from fossil fuels. The Board of Governors, surrounded by students on all sides. Photo by Mike Graeme, Senior Staff Writer. So whatever happened after the Board of Governors walked out of the Senate Chambers? UVic communications representative Denise Helm confirmed the Board reconvened privately to pass the budget. “UVic’s operating budget of $401 million was passed with its balance of revenue including government grant and tuition, and expenditures including for scholarships, fellowships, work study and academic programming including engineering and JD/JID expansion,” said Helm. There were four individuals on the Board who voted against the budget: undergraduate representative Pierre-Paul Angelblazer, graduate representative Andrea Mellor, and two of the Board’s newer appointees: Merle Alexander and Kasari Govender. The remaining Board members voted in favour of the budget. Angelblazer confirmed that as the undergraduate representative, he had previously lobbied the Board to not raise international undergraduate tuition, but noted these decisions have been a long time coming. “There’s a lot of assumptions that people have in the arguments that they do make when they’re speaking in favour of [tuition] increases,” he said. University Secretary Carrie Andersen said the BoG would be discussing the protesters’ demands at the next meeting in May. Andersen said this is the normal correspondence procedure for the Office of the University Secretary. Gorrill lamented that deliberations were unable to continue in open session. 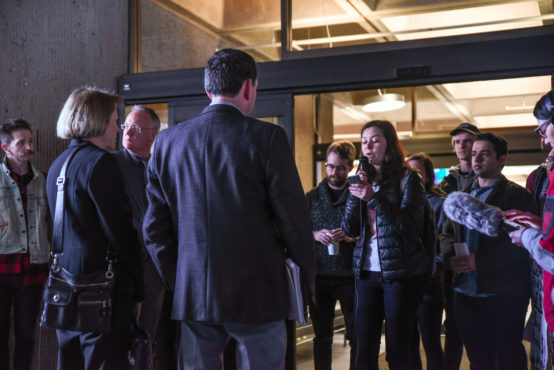 “It’s unfortunate that these important conversations were not able to continue in an open meeting where students could hear the various perspectives of Board members,” she said. Gorrill also pointed to the opportunities for needs-based bursaries available to international students. “For international students, although we did provide notice of the planned increases and they are required to have the financial ability to study in Canada, we know that for some students there are unexpected circumstances once they are at UVic,” she said. As for divestment, Andersen confirmed that this would be discussed at the next Board of Governors meeting. UVic was last formally asked to divest in 2016, and they declined. 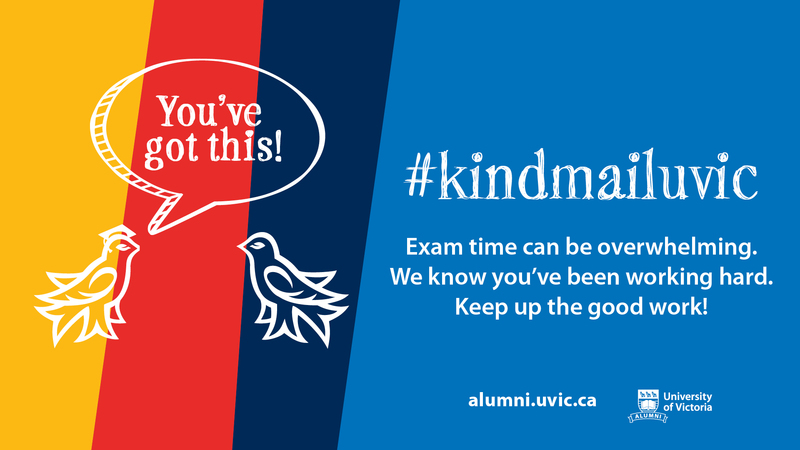 However, when the Martlet asked UVic Foundation Treasurer Andrew Coward if they might reconsider in 2019, Coward did not say no. “We’re happy to consider any new material information that could potentially change that stance,” he said. Although the Senate Chambers have emptied now, both Divest UVic and the students against the tuition hikes continue to organize. The next Board of Governors meeting will be held on May 28 at 11 a.m. in the Michael Williams Building, and the next Senate meeting will be held on April 5 at 3 p.m. in the Senate Chambers. Andersen expressed hope that the next Board of Governors meeting can return to open deliberations. This article was updated on March 28 at 4:34 p.m. and at 5:15 p.m. This article was updated on March 29 at 11:47 a.m.